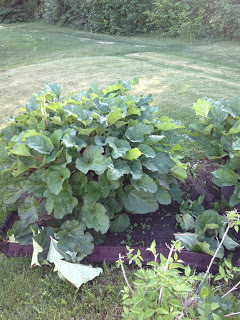 The weather has been perfect for growing a bumper crop of rhubarb. I fought the mosquitoes tonight to harvest rhubarb for baking a rhubarb coffee cake for breakfast at Camai B&B. 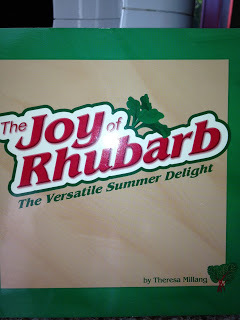 The cookbook is Joy of Rhubarb which is pictured to the left. The recipe comes from the cookbook. I baked it in a spring pan for 50 mins. rather than the 40 min. specified. What is planned for tomorrow morning’s breakfast? Coffee, teas (black, green or herbal), juices (orange, cranberry, or apple), and milk. As always we will have several kinds of fresh fruit served with plain Greek yogurt. The main course will be a choice of a vegetable quiche or a ham and cheese quiche or some of each. Reindeer sausage is also on the menu. 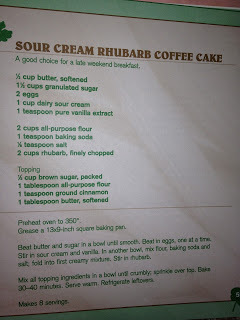 Of course, the rhubarb coffee cake will be served. Bon Appetit!